Claiming to serve the best food on the sea might seem like a bold proclamation, however, these six cruise lines are consistently part of the “best cruise cuisine” conversation. Whether it's famous Chefs inspiring the menus, locally sourced ingredients or unique dishes and dining experiences onboard, these foodie-friendly cruise line aims to offer unique memories and experiences you can’t get anywhere else. AmaMagna's chefs are culinary masters. While incredible views of exotic destinations and cheerful company enjoying great service can help make a meal unforgettable, it’s the food itself that cuisine-loving cruisers consider the difference between good and truly gourmet. Here are the six best cruises for foodies, as recommended by our CruiseInsider experts. The all-inclusive Regent Seven Seas Cruises dining experience is hard to beat. No matter your craving, Regent offers high-end onboard dining for all palettes from its beautiful restaurants and poolside cafes to high-quality room service so you can kick back in the comfort of your own suite. 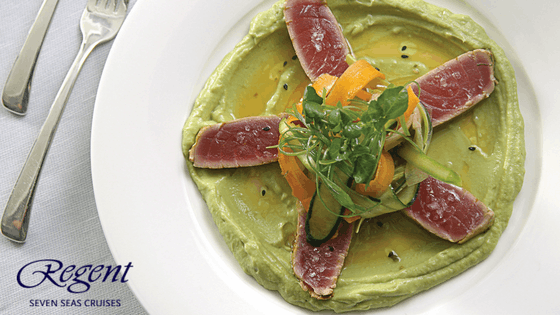 Regent's Tuna & Avocado Salad is a fresh, delicious favorite aboard several ships. Fans of the Food Network will recognize the face of Princess Cruise's stellar food scene, Australian celebrity chef and author Curtis Stone. Known worldwide for his culinary genius and made famous by his appearance on shows such as Take Home Chef, Top Chef Masters, The Today Show, The Ellen Degeneres Show, The Oprah Winfrey Show and more, Chef Stone’s contribution to cruise cuisine is his new restaurant SHARE. This wonderful food experience is available on select Princess Cruise vessels Ruby Princess, Emerald Princess and Sun Princess. SHARE features a six course menu that can be tailored to your individual tastes and can be experienced on your next Princess cruise for a nominal $29 per person surcharge. Insider Tip: Chef Stone also helped to create Crafted by Curtis Stone–a special culinary experience for Princess ships not featuring a SHARE restaurant–including fresh cuisine inspired by Chef Stone's menus and available in the main dining room. As a sophisticated Italian company, it's no surprise that delicious dining is an integral part of the Silversea Cruises experience. 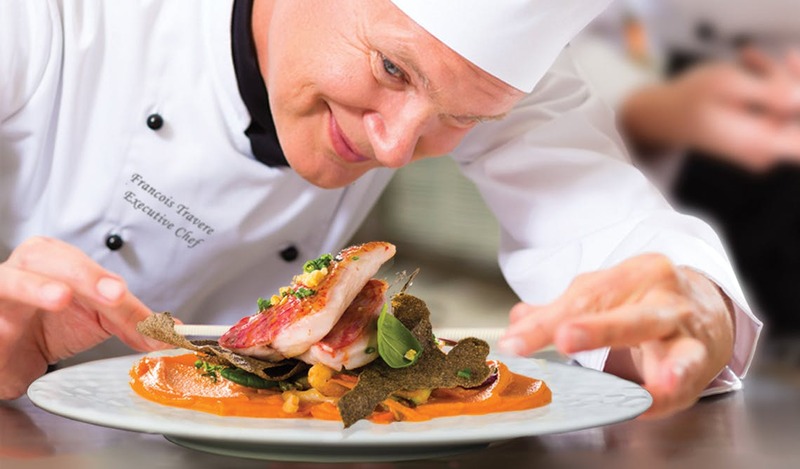 Thanks to their partnership with the prestigious Grands Chefs Relais & Châteaux, wherever you dine on a Silversea cruise you will find a diverse options of world class food and next-level service. Established in the 1950’s, Relais & Châteaux is an association of 550 plus restaurants, chefs, innkeepers and more from all over the world dedicated to promoting the richness and diversity of luxury cuisine. Through this partnership, Silversea Cruises maintains one of the highest standards in food quality, freshness and creativity both on land and on sea. Authentic recipes and the freshest ingredients come together with flair and passion at La Terrazza — a flavorful expression of Silversea’s distinctive Italian heritage. Delicious meals created with thought and panache, detailed and thoughtful service, discerningly elaborated menus with perfectly balanced wine choices and a relaxed atmosphere with erudite friends – dining aboard any Silversea ship is the ultimate experience for people who only want superlatives. Seabourn made waves both in the world of high-end cruising and fine dining when they partnered with world-renowned chef, Thomas Keller, creator of three Michelin star winning restaurants: The French Laundry, Per Se and Bouchón. 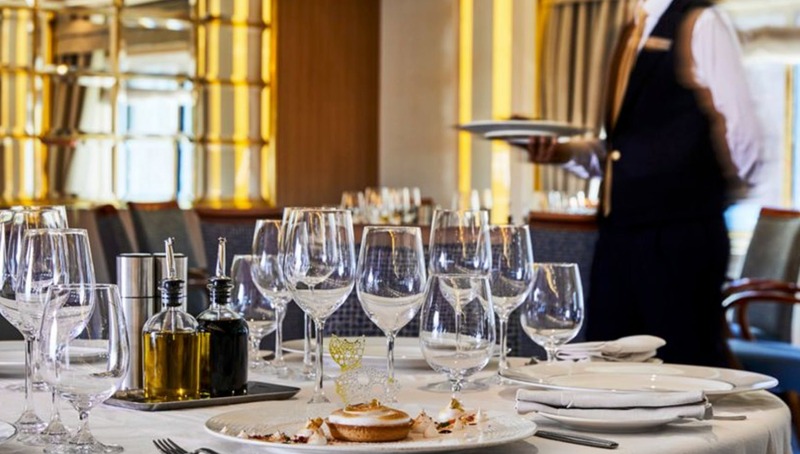 Insider Tip: Seabourn is a proud member of Chaîne des Rôtisseurs, one of the world’s most prestigious gastronomic societies devoted to the art of fine dining. As a celebrated champion of French style food and cooking, Thomas Keller brings his unmistakable style to Seabourn’s already luxurious cruise experience. Just like Chef Keller's famous land-based restaurants, Seabourn’s restaurants at-sea focus on using the finest ingredients available and providing service that elevates the experience of each guest. And best of all, Keller’s prestigious food is available at no additional charge to Seabourn passengers. 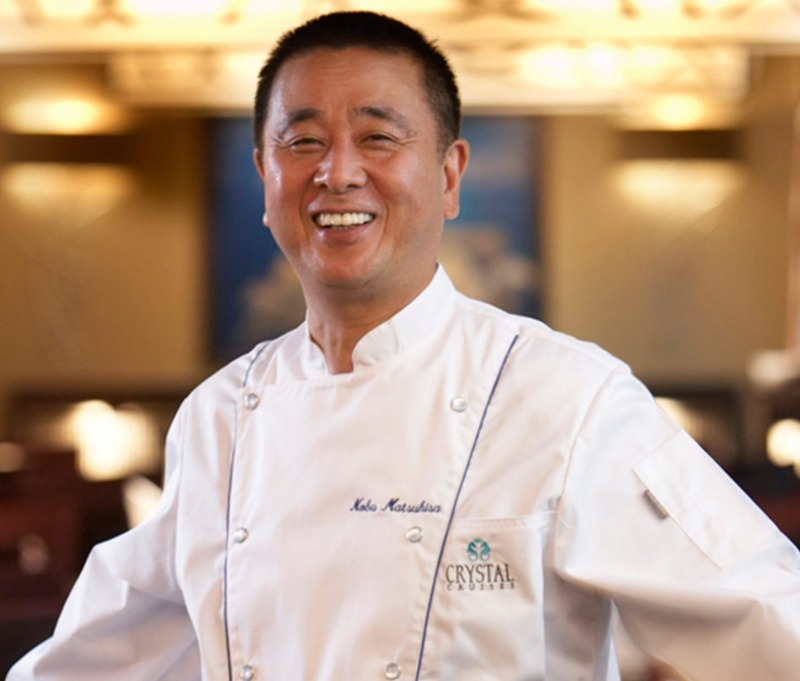 Guests on the Crystal Symphony and Crystal Serenity can enjoy an incredible selection of restaurants from acclaimed celebrity chef, Nobuyuke "Nobu" Matsuhisa, as well as several other amazing dining options created by Crystal’s own masterful culinary team. Chef Matsuhisa’s restaurant, Umi Uma & Sushi Bar, features dishes prepared by chefs personally trained by Chef Nobu himself. Dine on a collection of Nobu’s unique sushi and sashimi, or if you’d prefer, Umi Uma also offers a celebrated collection of Japanese-Peruvian dishes. Regarded for his innovative approach to sushi, Nobu blends classically styled Japanese foods with distinct Peruvian and European influences. Some of Chef Nobu's most popular dishes aboard Crystal Cruises (and some of our CruiseInsider experts' "can't miss" menu items) include the Salmon Tartar, Tiradito Nobu-style and Yellowtail Sashimi with Jalapeño, Lobster with Truffle-Yuzu Sauce, Grilled Wagyu Beef Rib-Eye with Wasabi Pepper Sauce, and Chef Nobu's signature dessert, a Bento Box filled with Chocolate Soufflé Cake with Shiso Syrup and Sesame Ice Cream. Insider Tip: Crystal passengers can enjoy Chef Matsuhisa’s restaurants for free, once every 7 days on a voyage and reserve additional meals for only a $30 surcharge per person. It's one thing to claim to serve the finest food at sea, it’s another thing to back it up! Oceania's cuisine rivals even Michelin-starred restaurants ashore and are a hallmark that distinguishes the Oceania Cruises experience from any other. 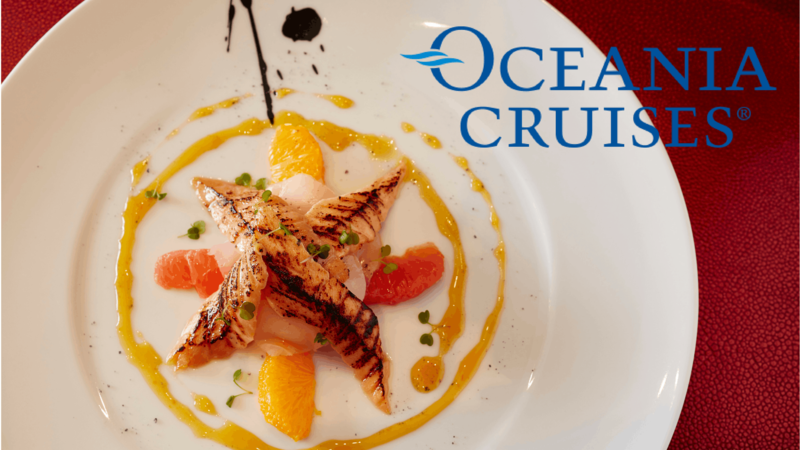 In partnership with one of the world’s first and most famous master chefs, Jacques Pépin, Oceania Cruises remains the unequivocal standard in cruise cuisine. Oceania's Chefs are simply the best at sea, performing feats of gastronomic wizardry nightly. One of the world’s most prominent foodie figures, Chef Pépin serves as Executive Culinary Director for Oceania Cruises and has starred in numerous TV shows, inspired dozens of legendary chefs and his book La Technique is the standard for teaching French cooking to this day. Pépin even won a daytime Emmy alongside the famous Julia Child for their PBS series Julia and Jacques Cooking at Home. Jacques - Jacques Pépin’s personal touches are all over this French bistro, from the countryside ambiance to the cosmopolitan yet wonderfully embraceable cuisine. Toscana - an authentic Italian 'ristorante' with classic, rustic dishes served on custom-designed Versace china. Polo Grill - a classic steakhouse that serves some of the best steak and seafood anywhere on the high seas. Red Ginger - an adventurous combination of Asian flavors mixed with French cooking guaranteed to dazzle. If these culinary cruise adventures sound delicious, connect with a CruiseInsider expert today at 1 (877) 734-6858 and we’ll guide you through booking the perfect gastronomic cruise adventure guaranteed to satisfy the foodie in you!